Centaur Hot-Rail, Roll | Hoover Fence Co.
Hot-Rail® Electric HTP® Rail is an innovative fencing product that combines the patented Centaur HTP® technology with electric fencing properties, significantly reducing installation time. This 5" rail is available in three colors designed to blend or contrast with your farm's color schemes. Its five-inch polymer "rail" with three 12-1/2 ga. imbedded high tensile wires is designed with an impressive minimum break strength of 4,400 lbs. per fence rail and features the ability to flex back into place after impact reducing the chances of injury to animals and damage to fence. Hot-Rail® Electric HTP® Rail is unique since it is installed in a continuous loop and attached to posts with a patented "Belt Loop" Bracketing System. This attachment method has two strong advantages over alternative methods: the continuous loop system is more flexible than rigid individual rails of 8, 10, or 12 feet; the Belt Loop Brackets also allow the rails to slip freely, absorbing and dissipating any impact down the entire length of fence. Hot-Rail® is virtually maintenance-free. Hot-Rail® will retain its beautiful appearance for many years and will not rust, warp, rot, peel, chip, stretch, fade, shatter, or splinter, a fact confirmed by both a QUV tester (an accelerated weatherometer that mimics a lifetime of wear in a short time) and by thousands of installations. These features make Centaur HTP® an economical alternative to vinyl post and rail fence which boasts the same benefits at a higher cost. 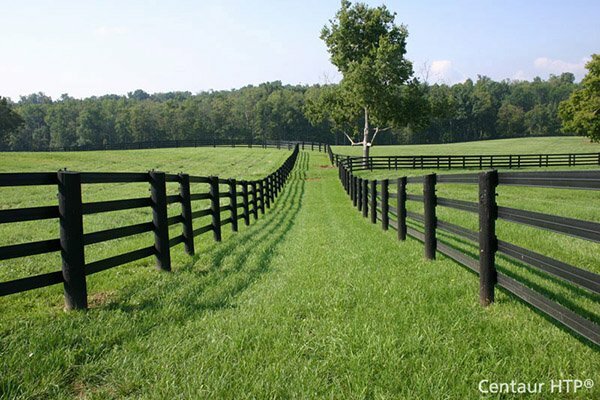 Centaur HTP® is also an obvious choice for fence when compared with wood board, split rail, and other farm and field type fences. Hot-Rail™ carries a 30 year limited warranty against cracking, rotting, peeling, fading, and loss of conductive properties. As with most of the products we carry, the life of the product will outlive the warranty. Hot-Rail® is available in white, black, and brown with matching brackets. Rolls are available in 660' and 330' lengths. You may mix and match rails, i.e. Hot-Rail® 5" rails for top rail with PolyPlus® HTP® as bottom rails. Installation is easy enough, most customers choose to install it themselves. Rails are installed continuously around fence area and tighten using insulated barrel tensioners. Rails are connected to posts with a bracket allowing rails to slide and 'give' for the entire fence length. All components are sold separately. Fact is, Centaur® builds an amazingly durable fence material. Properly installed, it will last as long or longer than we say it will, and longer than any competing product. Thus, the manufacturer is quick to warranty against all manufacturer's defects, including cracking, peeling, chipping, and discoloration due to adverse weather. The only problems ever encountered by our customers are due to incorrect installation. If you plan on doing it yourself, don't cut corners. Follow our recommendations to the letter. This way you'll be sure to get a fence you're absolutely delighted with for years to come. How is Centaur HTP® fencing made? Centaur proprietary fencing is flexible high tensile polymer material that is a blend of impact modifiers, UV stabilizers, and anti-fungicides. Formulated for strength, durability and appearance under any temperature and climatic conditions, HTP fencing material is color-fast, stain resistant, and mildew resistant. Centaur HTP withstands temperature conditions from -40°F to 200° F without becoming brittle or experiencing any kind of polymer breakdown. Centaur HTP is mechnically bonded to steel wire or wires. Mechanical bonding means that the wire and polymer are joined during manufacture. As the polymer is cooled, it shrinks tightly around the wires. This creates a natural link between the wire and polymer, while allowing each to expand and contract in temperature changes without pulling and degrading the polymer. In general, the initial cost of vinyl fencing is higher than other fence styles. However, when compared on the long run, vinyl fencing remains maintenance-free while other fence styles increase in maintenance and repair costs. What are the recommended heights for your fence? We recommend 55" - 56" as the standard post height on level terrain for horse fencing. How much space should I allow between fence posts? It depends on the lay of the land and the breed of horse you plan to contain. For level to gentle terrain 12' spacing can be utilized. As the terrain is more severe or curving you should consider closer spacing of 10' or 8'. Keep in mind with closer spacing you will increase the strength of the fence. What kind of post do I use? We recommend CCA-treated Southern Yellow Pine. These posts are strong and will add to the safety of the fence. A usual installation might include six 7" x 8' corner and end posts and four 5" x 8' line and brace posts. Yes, we send a detailed installation manual with every shipment, and provide technical assistance over the telephone. Following the installation manual will ensure warranty certification upon completion. Do you have installers in my area? We do not have a nationwide network of installers, nor do we have the resources to keep track of their services. We recommend checking the yellow pages for local contractors. All manufacturer's defects. This includes cracking, peeling, chipping, and discoloration due to adverse weather. Abuse to the fence is not covered. We recommend the use of metal brackets and/or electric in high traffic areas. Should I mount the rail inside or outside of the fence? It's your choice, as the 3.5" ring shank nails hold the rail tight provided you correctly follow installation instructions and bracing. But before you choose, consider this: placing the rail on the inside of the fence denies horses access to the fence posts, is the strongest method of installation, and is recommended to provide optimal performance. However, rails on the outside of the fence often look better. Is it safe for foals? Absolutely. We recommend you install posts at 8' intervals to allow less gap when rails flex. Will my horse chew the rail? Most horses do not like to chew on polymer fencing, as it's not palatable to them. If horses abuse the railing we recommend electric or a crib strap. How many tension assembly kits do I need? A termination assembly is needed to tighten each rail, but only one is needed per 1320' of rail. The fencing can be continuous around corners and up and down hills. Areas less that 100' can be constructed with end post fasteners. Which rails/ wires are conductive? Hot-Rail® and White Lightning® are both conductive. What is the recommended number of Rails or Coated Single Wires to be installed? For our Centaur HTP or Hot Rail you can choose 3 or 4 rails. For Coated Single Wires, PolyPlus or White Lightning, we recommend a minimum of 5 strands, or you can choose a combination of both. All are with wire links or crimp fittings. Be sure to order the correct ones based on gauge of wire to splice.